Autumn Bliss - An early full bearer with an extended bearing season (into October). Large medium to dark red, pleasant, mild flavored fruit. This high yield variety may be grown without support or trellis. Resistant to Mosaic Virus. (image)​. Boyne - A vigorous, erect, sturdy bush. A clean and east to pick vine even without support or trellis. Very hardy and reliable cropper with sweet medium size fruit. Very dark red berries spring to summer. Fall Gold (Everbearing) - Golden everbearing raspberry. Large, soft berries, conical in shape, very sweet flavor. Excellent for fresh eating and processing. Ripens in July with second crop ripening from late August until first hard frost. Not recommended for extreme northern areas (image)​. Heritage (Everbearing) - Large, sweet, dark red berries with a mild flavor. This superior quality berry is good for fresh eating, freezing, canning and preserves. The canes are tall for an everbearing raspberry, but are very sturdy and seldom require support. Strong, vigorous, very productive, suckers prolifically and spreads rapidly. Fairly tolerant of heavier soils but will develop root rot in poorly drained areas. Moderate summer crop with heavier, superior fall crop. An excellent variety for the home gardener and also grown commercially in many areas. 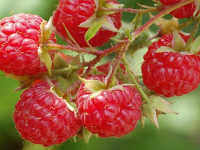 Latham - Large, very popular variety with dark red, full flavored, aromatic fruit. Very productive, long sturdy canes. Exceptionally hardy, disease resistant, mosaic virus free plant ​(image). 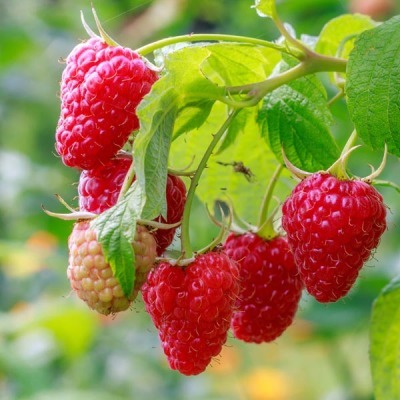 Meeker (Spring Crop) - Large, thimble shaped, dark red fruit with high sugar and good quality flavor. Good home garden variety for eating fresh, freezing, canning, and processing. Meeker is not particularly adapted to heavy soils but is a vigorous plant with long willowy growth. Very productive with long harvest season. Ripens mid-season. Meeker has some resistance to Botrytis Rot. Newburgh (Spring Crop) - Very large, firm, sweet, light red berries with shallow caps. Mild flavor with fairly good quality. Retains its shape well and does not crumble when being picked. A very good variety for jelly and freezing. Vigorous, heavy annual producer that is resistant to Root Rot and Mosaic Virus. Newburgh is widely adaptable and takes heavy wet soils fairly well. Also a low growing variety that doesn't need as much support as taller varieties.